For my birthday this year, amongst other very lovely presents, I was spoilt with a magimix from my parents (how I've longed for one!) and from my very generous brother and his girlfriend, a voucher for a beef butchery course at The Ginger Pig. So last night, apron in tow, I headed to The Ginger Pig on Moxton Street for a night of beef! The Ginger Pig is a chain of 5 butchers in London (Marylebone, Victoria Park, Borough Market, Waterloo, and Shepherds Bush - where they opened just last week). All their meat comes from their four farms in North Yorkshire, and they are renowned for some of the best meat in London. They offer courses in Lamb, Beef and Pork butchery, sausage making, and for the next two months, festive meat. The course started with a short talk about the farms, and the dry hanging process the beef is aged by. Supermarkets and some butchers age their beef through a wet ageing process - where the meat is vacuum packed instead of hung, which creates much less flavour. The two butchers then got the roasting (the section from the shoulder to the rump) of beef down from it's hook (it weighs about 45kg) and showed us through all the cuts of meat down the back of the animal. It was so interesting to really see where you food comes from, and from that learn exactly how different cooking methods suit the various muscular areas of meat. The less used muscles working best for quick cooking, and those more worked for slow. The huge fillet steak we took off the joint was whisked away and cooked up as a delicious appetiser whilst we learnt more about the cuts of beef, as Barry the butcher took them off the roasting. Then we got our own piece of beef to butcher. Luckily (and I really mean this - I would've lost at least one finger) we were given a glove made out of metal threads to wear on the hand we weren't holding the knife with. The piece of meat we were given was a 3kg piece of cote de boeuf - made up from the brisket skirt and the ribeye - a delicious roasting joint, still on the bone. We were, however, required to remove some bones, and clean the others. And I ended up with this - a 2.2kg cote de bouef to take home, worth over £60. More on that to follow after Sunday! Despite being very able to fillet and deal with fish, I've never really tried to use a knife on raw meat - I get my butcher to do it all for me normally! So I was very pleased with myself! All the time we'd been listening and learning, a huge forerib of beef (from 6 cow ribs....) had been cooking for 4 hours at 180C, then rested under foil for an hour. The results were astonishing - and our dinner. We were given a plate with more meat on it that I'd normally eat in 3 weeks, gorgeous creamy dauphinoise and a crisp green salad. With a good serving of red wine. Following a wonderful bread and butter pudding, I waddled back to the tube, pleased as punch, with enough leftovers from supper for another meal, and a serious piece of beef to cook on Sunday - can't wait! 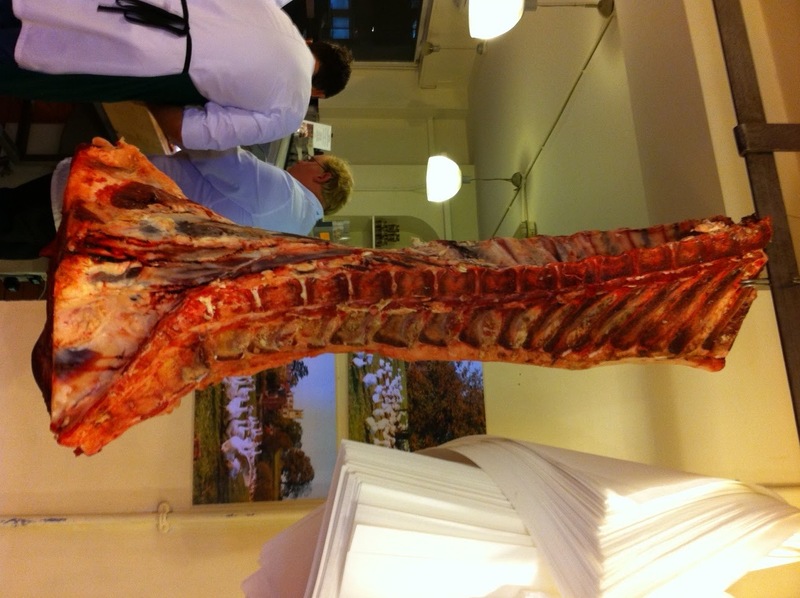 For more information on The Ginger Pig's butchery courses, butcher shops and farm, go to http://www.thegingerpig.co.uk/ and http://www.learnbutchery.co.uk/. Now this, this looks like an amazing class! It was brilliant. Although it seems expensive it's actually great value for money as you get to eat loads and take away so much meat. I've spoken to people who've done the course with lamb and pork and all said it was really great.